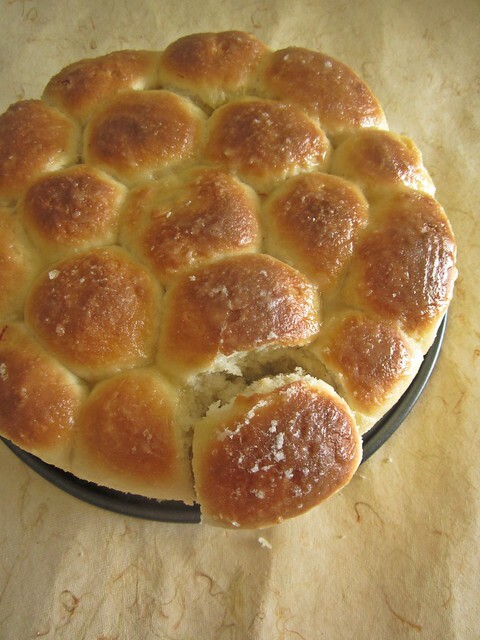 Having missed the last month's bake,I was eager to know what Aparna would challenge us to bake this month.Though the name sounds a bit complicated,the recipe is quite simple.A plain dinner roll kind of buns,filled with a sweet or savoury filling and baked in a round pan which after baking resembles a honeycomb,hence the name. 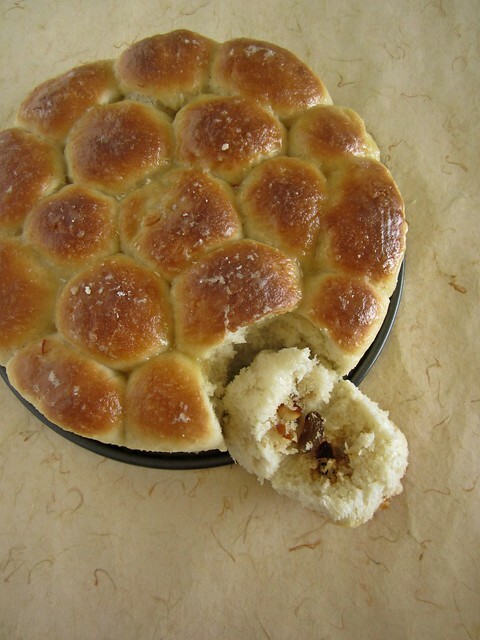 Khaliat Nahal translates as Bee's Hive in Arabic,owing to the appearance of the buns.The buns are baked closed to each other in a round pan where they form a honey comb like pattern.Traditionally,these buns are made sweet with a cream cheese filling and covered with a sugar syrup or glaze after baking,which is typical of many Middle Eastern confectionery. 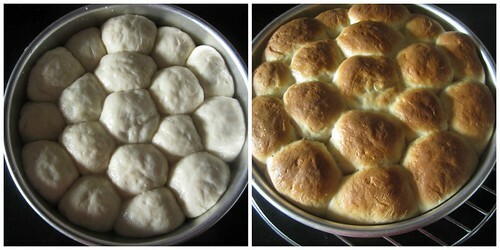 The recipe makes 18 small sized buns,you could easily halve the recipe to make 9-10 buns and bake in a 6' or 7' round tin. 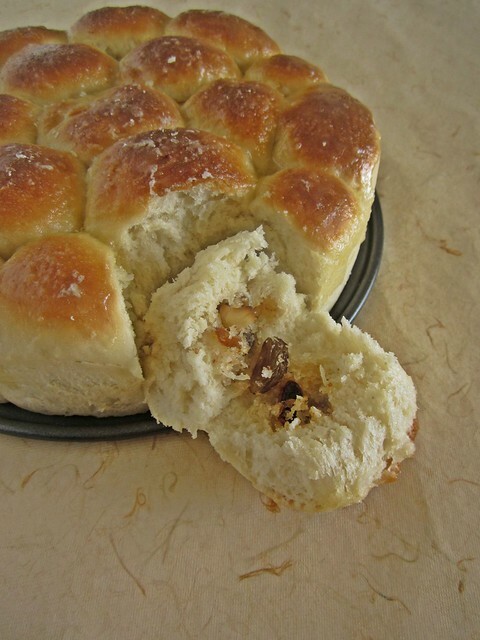 The filling is entirely up to your choice.I was intrigued with the idea of a sweet filling and the pouring of sugar syrup after the buns are baked so went with that.Keeping in mind the middle eastern origin,I used a coconut-nut filling which is a family favorite of ours.Remember Dilkush buns? The texture however was absolutely wonderful.Soft,airy and pillowy these buns were finished in a splash.I love buns with sweet fillings and this one has become a favorite now,especially owing to the ease of making the simple dough.Only thing I would do next time is probably refrigerate the dough after the first rise,that'd delay the rise as I finish off with the filling. Savoury - cream cheese OR crumbled feta cheese OR crumbled paneer/ cottage cheese, flavoured according to your choice. You can also use any other savoury filling that you want. I used a combination of crumbled paneer, herbs, chilli flakes, a little garlic and chopped spring onion. 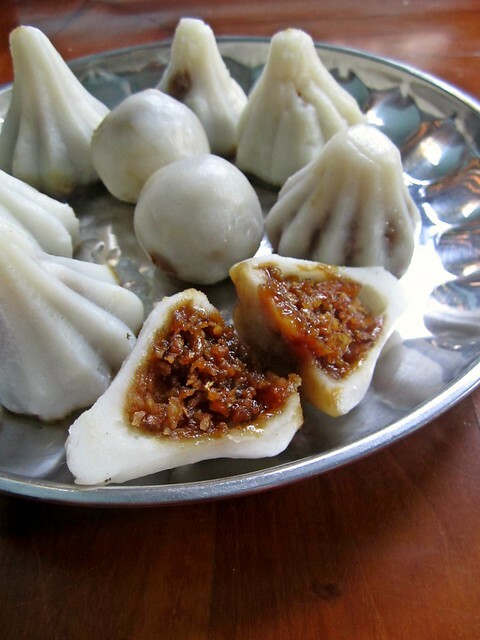 Sweet - cream cheese (traditional filling), or any other filing of your choice like chocolate, dried fruit like dates, apricots or raisins, chopped nuts, chopped fruit , sweetened coconut filling, etc. Make sure your melted butter has cooled down a bit before using it. 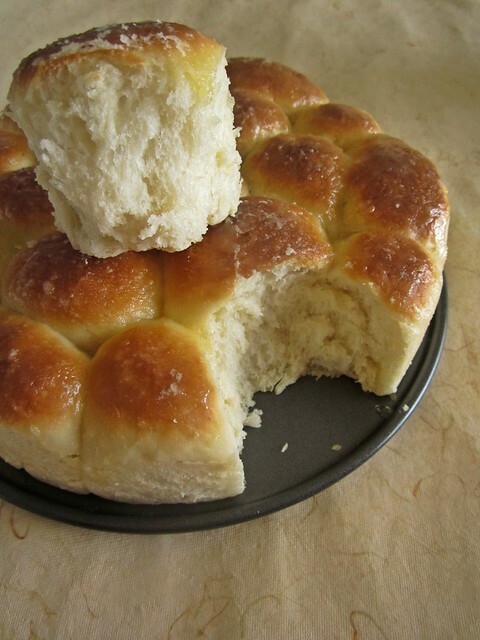 Put 2 cups of the flour, salt, sugar (if making the sweet bread only) and melted butter in the bowl of your processor. Run a couple of times to mix well. 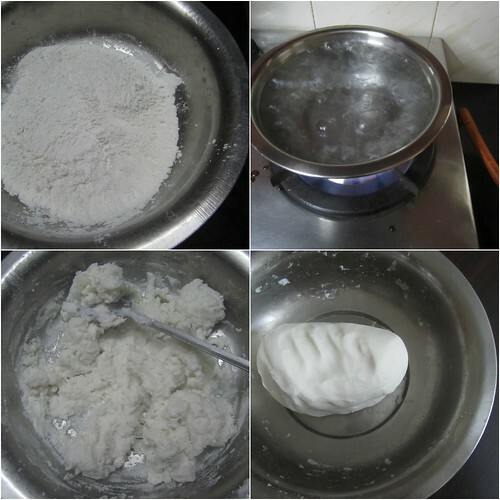 Combine the milk, sugar and yeast in a small bowl and keep for 5 minutes. Add this to the processor bowl and knead until you have a smooth and elastic dough which is not sticky. 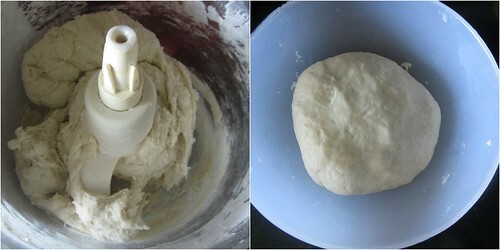 Add as much of the remaining 1/2 cup of flour as you need to get this consistency of bread dough. I used all of 2 1/2 cups of flour for mine. 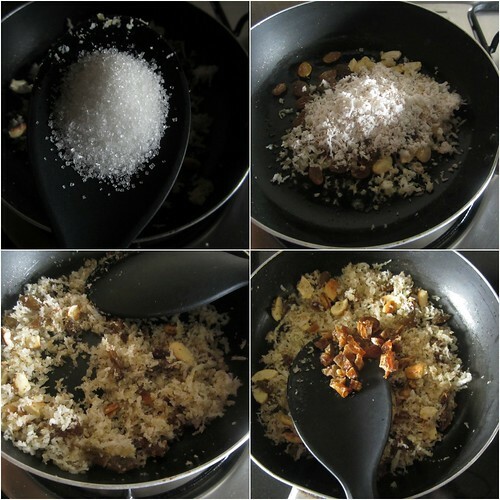 Meanwhile,make the filling.I just went with a free hand with the ingredients,you can add more/less nuts or sugar according to your choice. In a pan add about 1 tbsp ghee and saute cashewnuts and raisins(about 2 tbsp full). Mix in about 2 tbsp sugar and 3 tbsp grated coconut and saute for a minute.Add 2-3 seedless dates chopped fine.Keep aside to cool. 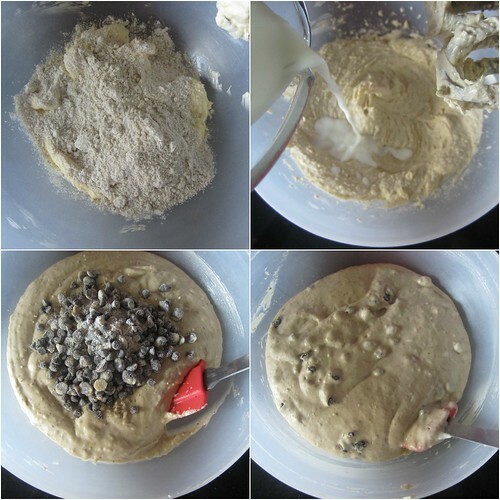 Turn the dough out onto your work surface. You won’t really need to flour it as the dough is quite manageable as it is. Cut it into 2 halves. With your palms, roll out each half a “rope” about 9” long. Cut each rope into 1” pieces so you have a total of 18 pieces. Take each piece and flatten it out a little and place half a teaspoon of filling in the centre. Pull up the sides and wrap the dough around the filling, pinching it closed at the top. Smoothen it into a round ball. Place this in a well-greased round 9” cake tin. Repeat with the remaining 17 pieces and the filling. 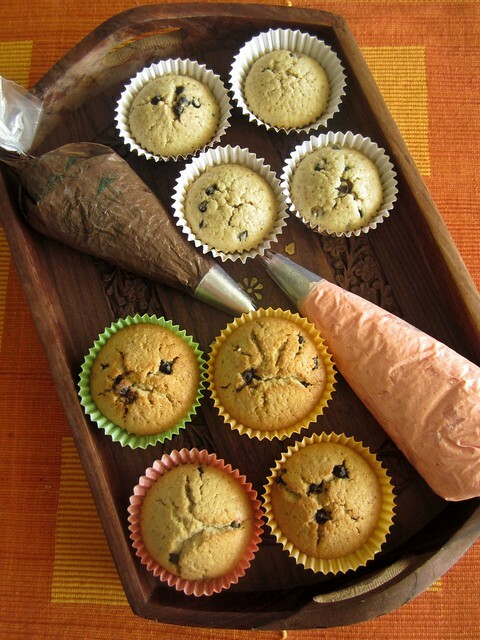 Arrange the filled balls of dough in concentric circles, filling the base of the cake tin. Cover with a kitchen towel and let it rise for about 30 to 40 minutes. 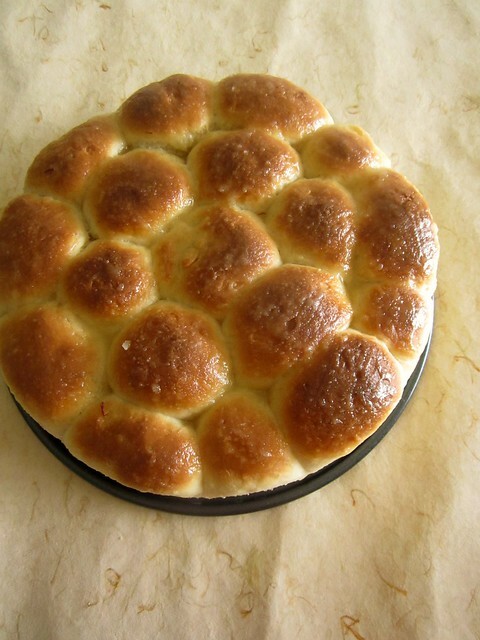 Brush the tops with milk and sprinkle the sesame seeds over this. 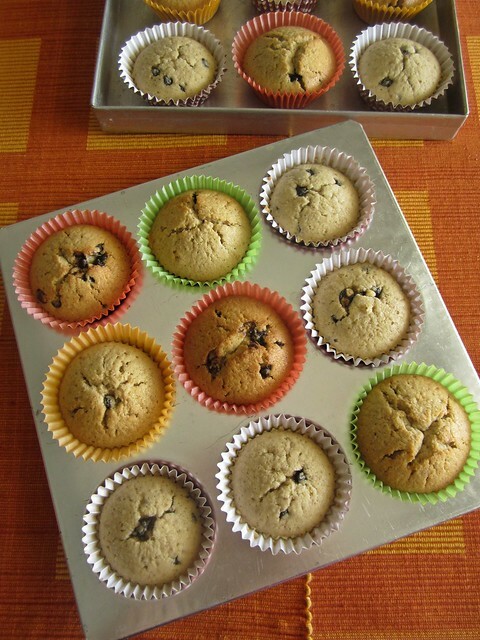 Don’t use the sesame seeds for sweet bread, only for the savoury one. Bake the buns at 180C (350F) for about 25 minutes, until they’re done and a nice golden brown on top. 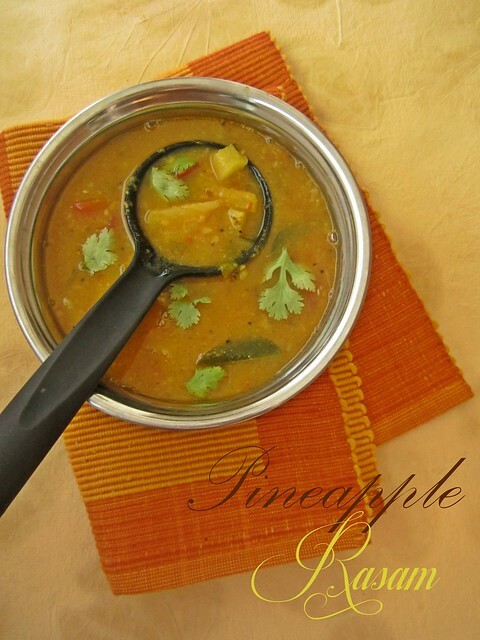 When I volunteered to make Pineapple Rasam for our potluck Ona Sadya,the first reaction was a gasp.Rasam?that too with Pineapple,none had even heard such a rasam existed.Well,neither did I a while back.I liked the idea of adding sweet and sour pineapple slices to a tangy tomato rasam,what an amalgamation of flavours,isn't it? 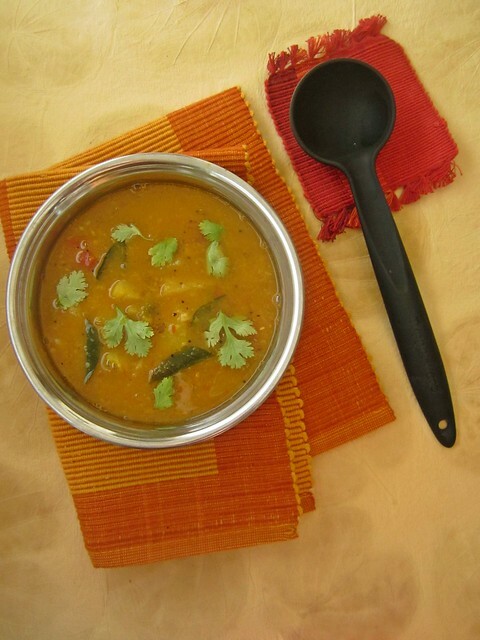 When it comes to making rasam,I'm sometimes stumped.Here is a simple side-dish with dal,tomatoes and rasam powder,sometimes even without dal,I wonder how people say it is an easy recipe to make.If not made well and if there is no balance of flavours,it will just end up being a watery side-dish with some tomatoes in it and I tell you,it is not a good thing at all. 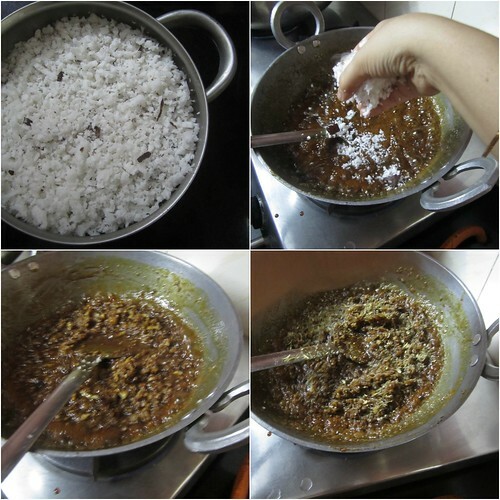 Pressure cook toor dal with enough water and mash it well using the back of a spoon.Keep aside. 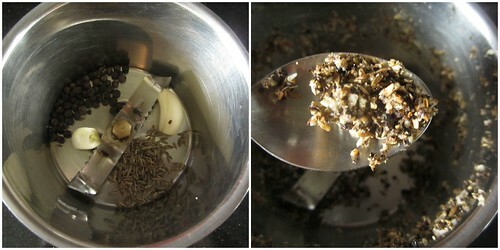 Grind pepper,jeera and garlic cloves to a coarse paste. 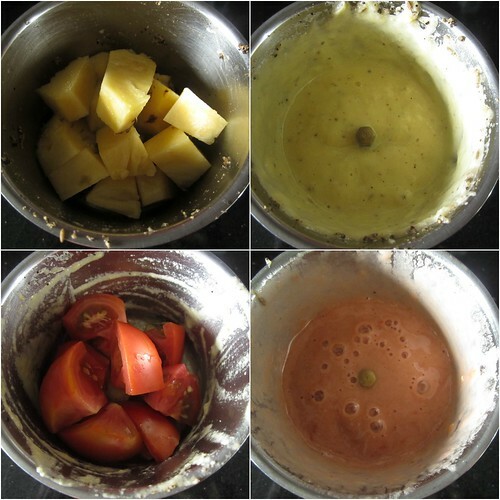 Make a paste of half the pineapple slices.Puree one tomato and chop the other. 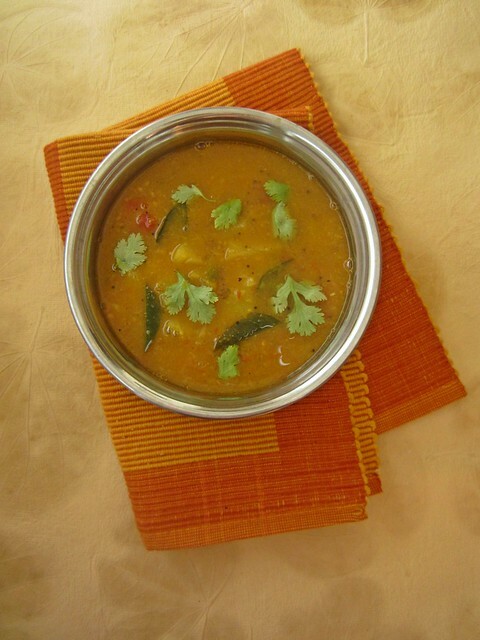 In a bowl,mix together pineapple paste,tomato paste,rasam powder,turmeric powder and 3/4 of the pepper-jeera-garlic paste and add a cup and half of water.Mix well and keep aside. 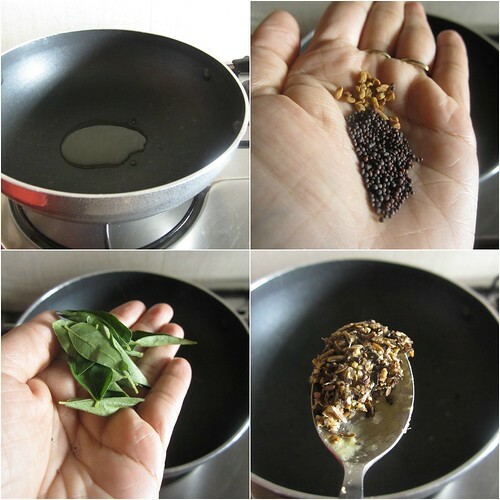 In a kadai add oil and splutter mustard seeds and methi.Mix in curry leaves,pepper-jeera paste and hing. Add the chopped pineapple and tomato and saute for a minute.Mix in the puree and stir well.Add salt to taste and let it come to a boil.Simmer till the pineapple chunks are soft. 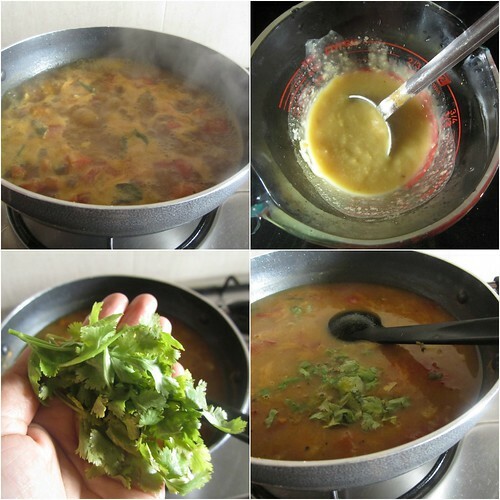 Mix in the mashed dal and cook for 2-3 minutes.Add chopped coriander leaves and switch off the flame.Cover with a lid and let the flavours infuse. 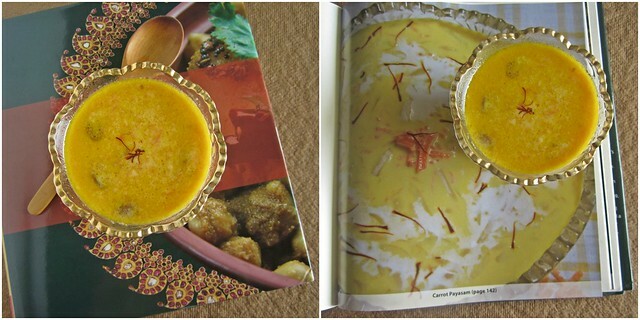 Serve hot with rice,potato roast and appalam. Choose just ripe pineapples which would taste sweet and sour rather than over-ripe ones. 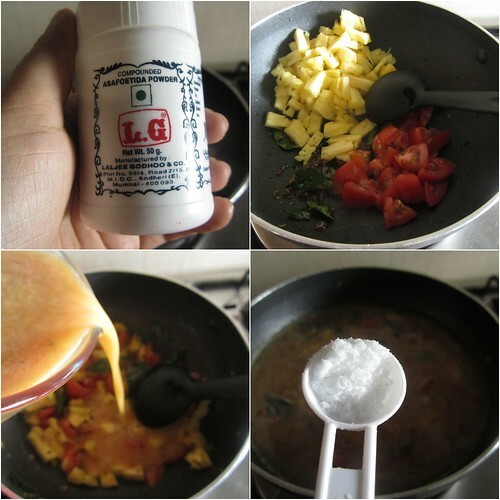 My rasam turned out a little thick than usual,so I'd reduce the amount of dal next time.Adjust the consistency according to your preference. 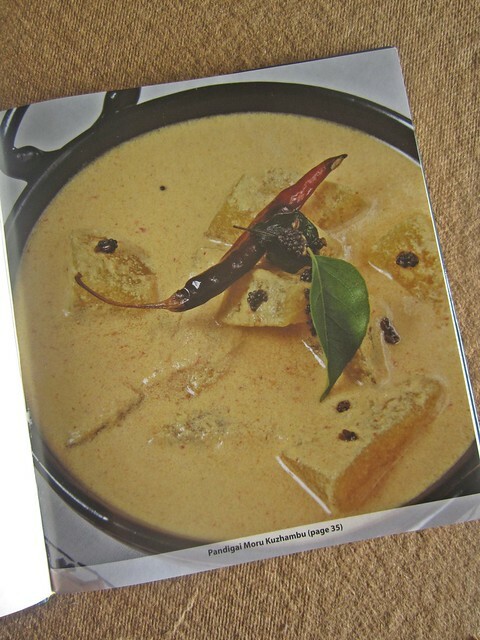 I will think twice now when I say I cook South Indian food,really.There are so many varieties spanning all the 4 states of South India that I should be eating humble pie now,or should that be humble Dosa:).When MySmartPrice sent me the book Southern Flavours by Chandra Padmanabhan for a review,I was in for a pleasant surprise.So many recipes from all 4 states of South that I couldn't help notice but the comparisons between each. 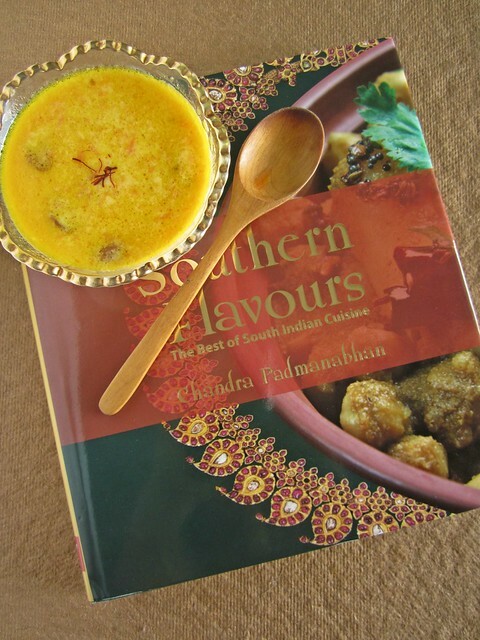 Southern Flavours is a collection of the authors' favorite recipes from her previous three bestselling cookbooks,which explores the cuisine of Andhra Pradesh,Kerala,Tamilnadu and Karnataka with samples from each state and community. 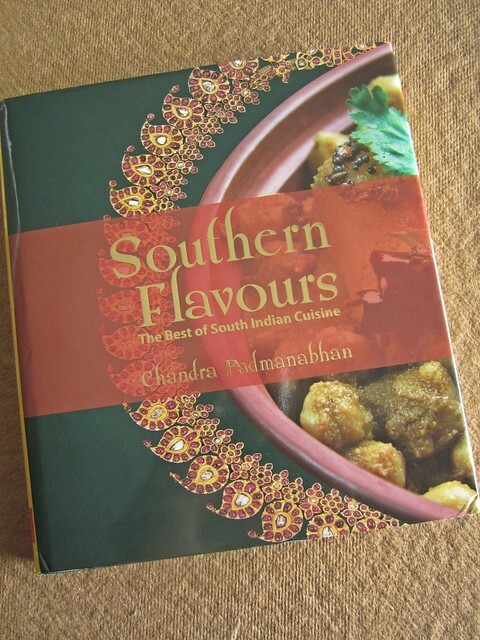 About the author - Chandra Padmanabhan is the author of three best selling cookbook titles - Dakshin,Southern Spice and Simply South.The last one won the author the international Gourmand award for Second best vegetarian cookbook in 2009. The book begins with a wonderful note about the vessels/utensils required to cook some of the dishes mentioned in the book.Detailed descriptions about Idli thattu/rack,Paniaramchatti and Dosa Tava/pan helps the reader get an idea on how to use these,especially useful for people who have no idea how a paniarachatti looks like! 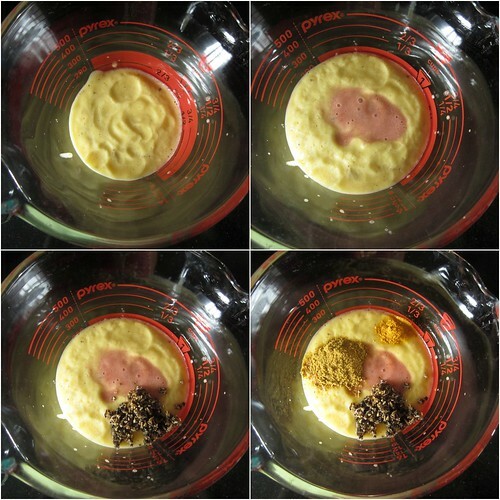 Basic recipes are covered in the first section which includes three methods for cooking rice-in the microwave,on the stove top and in a microwave.Recipes for Sambar,rasam,kuzhambu and poriyal podi from scratch follow.I'd especially love to try the poriyal podi and sprinkle it over simple poriyals which would elevate the simple poriyal to a gourmand one! 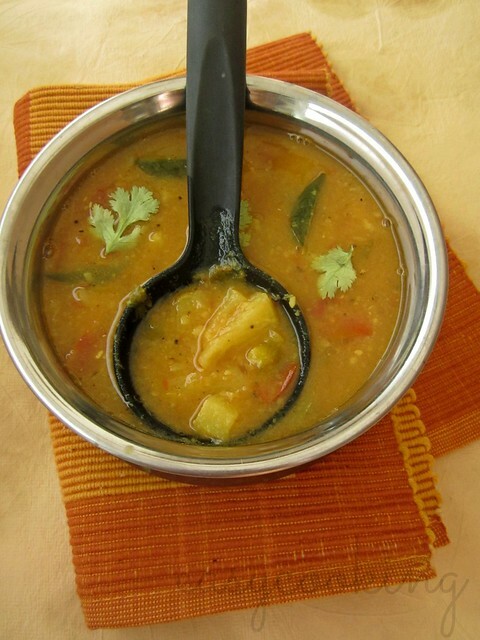 Sambar and Kuzhambu recipes are useful for people like me who think what side-dish to cook for rice other than 'just sambar and rasam'!There are 25+ recipes for curries which include Podi potta parippu Sambhar from Tamilnadu,Sheela Auntie's Pulusu from Andhra Pradesh,Kaay Hulli from Mangalore,Theeyal from Kerala and many more. 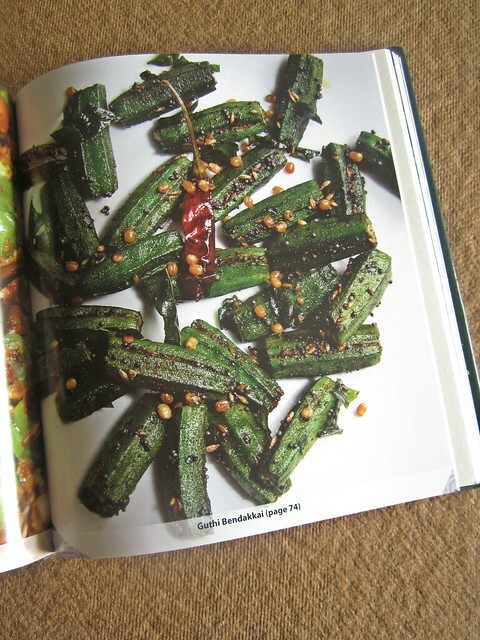 Poriyal and Kootu section is also very similar with recipes from all over the South,Beetroot-Carrot-Urulakizhangu Poriyal from Tamilnadu sounds delicious,so is the Sagalay from the Saraswath community of Karnataka.Though I am not a fan of Okra,the picture of Guthi Bendakkai from Andhra looks delectable.One recipe I've bookmarked to try here is the Urulaikizhangu Saagu from Karnataka. 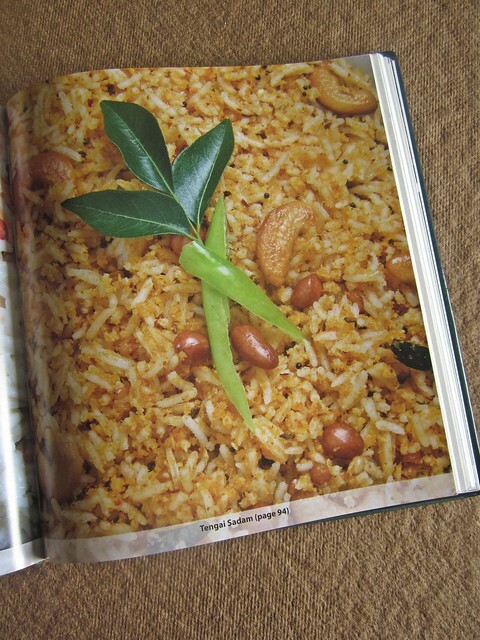 I found it amusing that there is not a single rice recipe from Kerala,really?No Ghee rice or Veg Biryani?Apparently not.Usual recipes feature in this one,Curd rice,Puliogaray,Thenga Sadam and the likes.I liked the recipe for Kothamalli-Pudina Sadam,would be definitely trying it out soon. 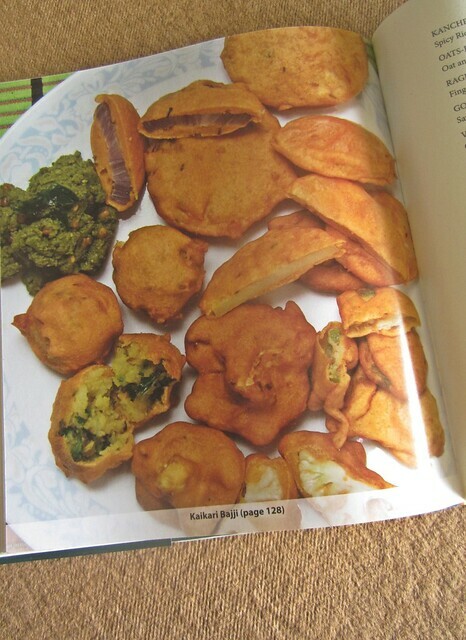 Sweets/Dessert section,though has limited recipes.Akkaravadisal,Paal Mithai,Tengai kadalamaavu Barfi sound interesting.There is also an Accompaniments section which includes recipes for Chutneys,Thuvayals and Pachadis.I loved the recipe for Summa Kuzhambu from Chettinad,sounds a lot like rasam but quick and instant. 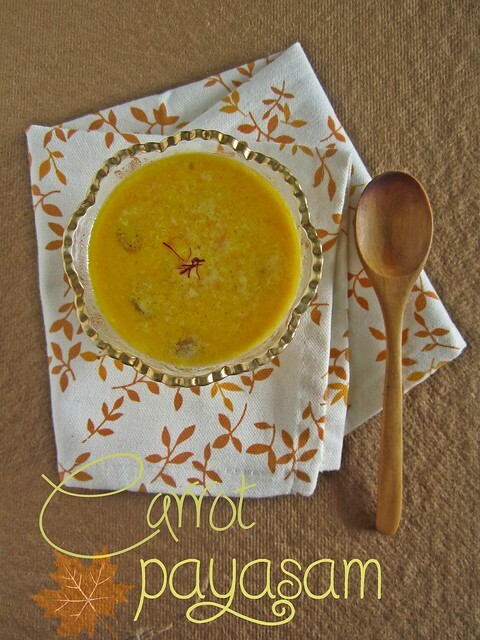 Since it was the festive weekend I decided to try out the unusual Carrot Payasam.I've never had it before so it was an interesting addition to our festive meal and was delicious.The lovely orange colour of the payasam comes from freshly grated carrots. Place 1/4 cup water in a heavy based pan.Add carrots and cook over moderate heat for 7-8 minutes till tender. Add remaining milk and simmer over low to moderate heat for 15-20 minutes till milk thickens a little.Stir in the almonds/or cashewnut and raisins(fried in 1 tsp ghee)and sugar and simmer till payasam has a thick,pouring consistency. Refrigerate and serve chilled.I served it warm and it tastes as delicious as it is cold. 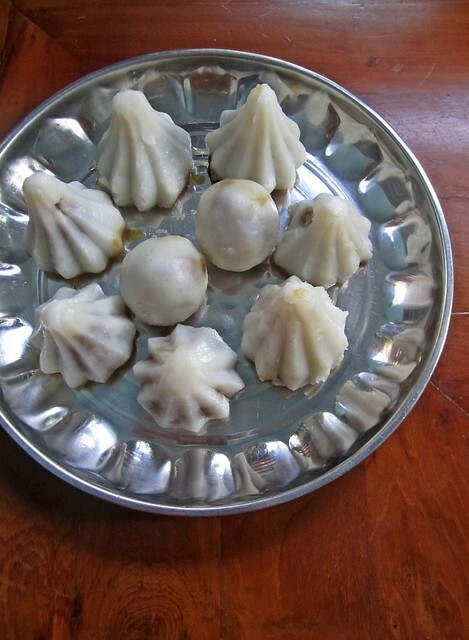 However,sometime back amma suggested I use the modak moulds for pretty shaped modaks and I thought it was a great idea.Last year,I was in Ernakulam for Vinayaka Chathurthi and me and amma decided to try making the modaks using the mould and I am happy to share it came out great. 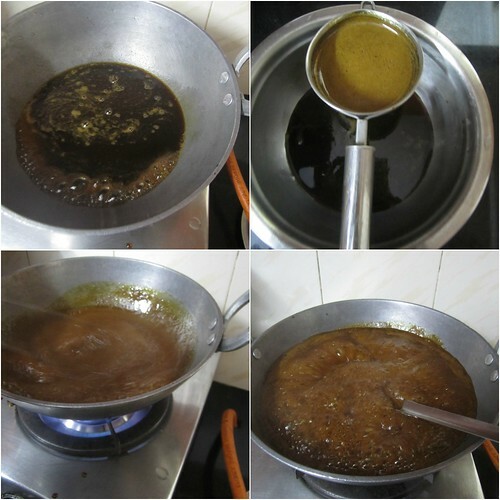 Melt the jaggery in a deep kadai and strain it while its hot.At home,amma uses dark colored jaggery,which has impurities so she always melts the jaggery first and strains it. Put the melted jaggery back into the kadai and when it starts to boil,mix in the grated coconut and ghee.Stir continuously for 5-7 minutes or until the mix starts to dry up a little.Add in the cardamom and switch off the flame.Keep aside. In a wide bowl add the rice flour and salt.Keep adding the boiling water to the bowl and mix simultaneously using a spatula.Start with 3 cups and add more using tablespoons until the dough comes together.If the dough is still dry add a few tablespoons more and if it is wet add few tablespoons of flour.It depends on the kind of rice flour you use.But always start with less water so you can control the consistency of the dough.Add oil and cover the dough till you prepare the modak. 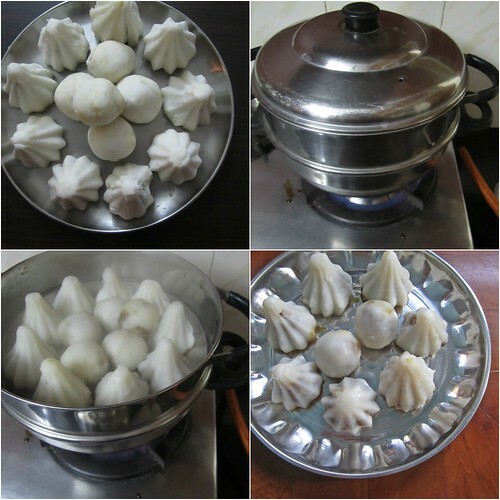 We used a modak mould but you can make it easily without it as well. 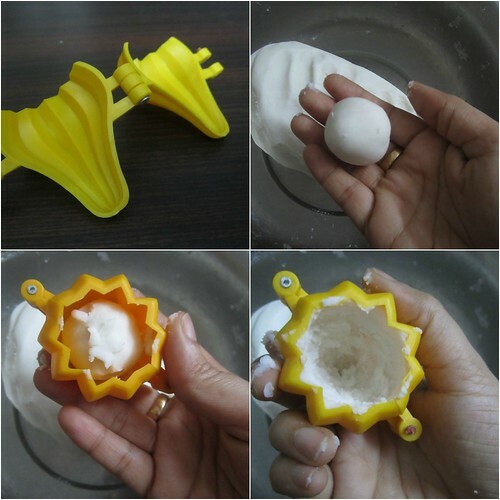 Make small table-tennis ball sized balls out of the dough.Grease the modak mould well.Place the dough inside the mould and spread well using your fingers. 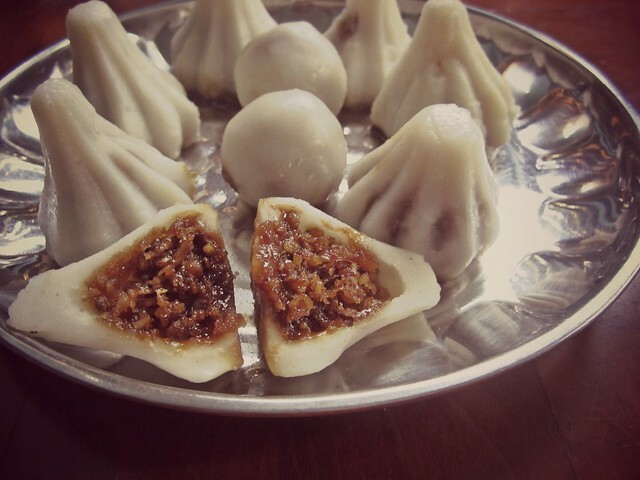 Add about 1 tsp full of the filling and cover with a pinch of dough.Open the mould and pretty looking modaks are ready to steam. 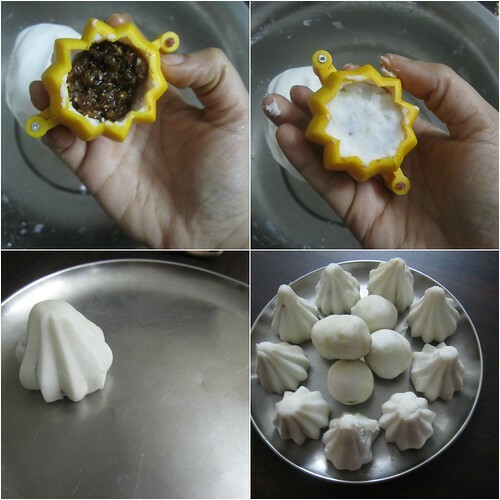 Another method- place the dough ball in your left palm and slightly flatten it.Put in the filling and close the ends.Now place this inside the modak mould and close the mould.Open the mould to get pretty looking modaks. 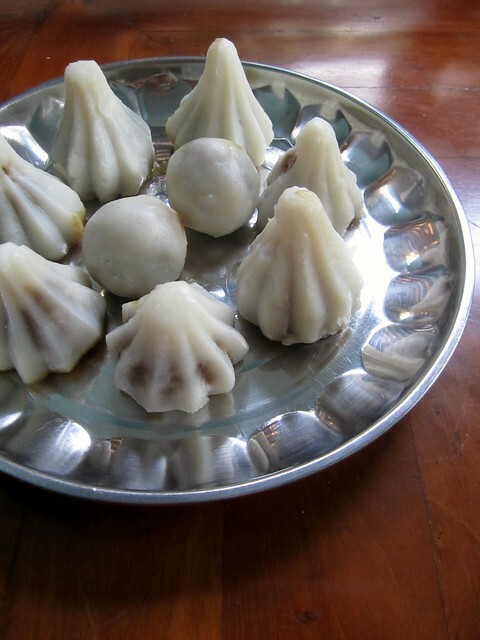 Place the modaks on a plate in a steamer and steam for 8-10 minutes by which time the modak would be done and the outside layer will have a shine to it. Serve to Lord Ganesha and devour as prasadam. Wishing all who celebrate a very Happy Vinayaka Chathurthi. 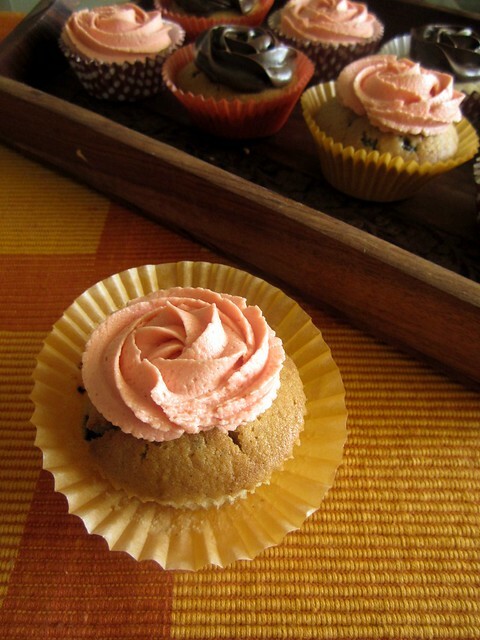 I can see festive recipes all over the food blogs these days as Vinayaka Chathurthi and Onam is fast approaching.But here I am with a cupcake recipe and there's a reason why.Do you go through these 'phases' where you try new recipes and one after the another,it fails?Well,I just went through that phase:).When seemingly easy recipes from reputed blogs fail I seriously start to doubt my abilities. Filled with the goodness of Almond meal,with a bite of chocolate chip in each bite these are a true delight to bake and eat.I decided to pep it up a notch higher and decorated these with buttercream and ganache rosettes,both whipped up earlier for different bakes. 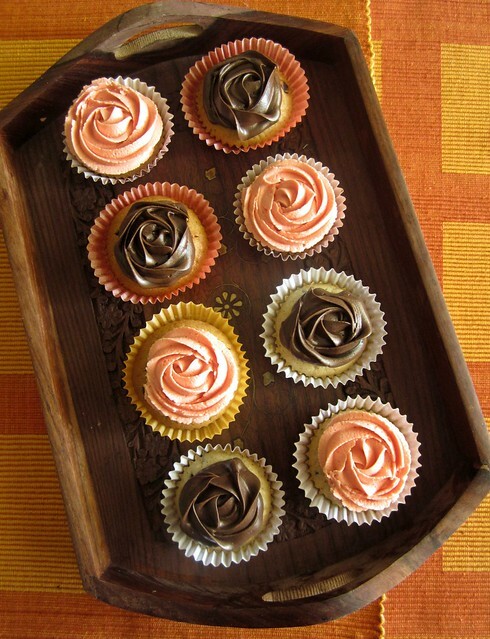 I still consider myself a novice when it comes to decorating.For the same reason,I attended a crash course in cake decorating at a talented bloggers' cake decorating workshop.I realized I knew how to pipe flowers and borders and shells etc but when it came to the real deal,I wasn't able to put it into practice.Subhashini Ramsingh,who blogs at Fondbites,patiently listened to my woes and tutored me well.Thanks to her,I don't feel as tensed anymore before piping designs. Coming back to this cupcake,they taste good without the icing as well.Moist and petite,it would make for perfect snack box treats.If you decide to frost the cupcakes however,I'd suggest chocolate ganache.There's something about the pairing of nuts and chocolate which takes the finished dish a level higher. 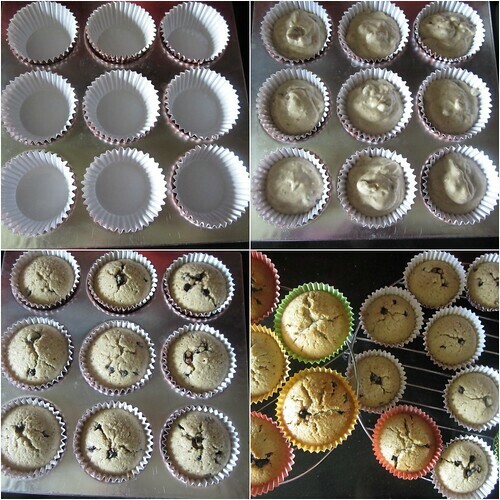 Preheat oven to 180C.Line the muffin tray with paper liners.I have a 9 hole muffin tray so I used it twice to bake. Pulse the almonds and sugar in 5 second spurts to a fine meal.Do not over process or else you'll end up with almond paste! 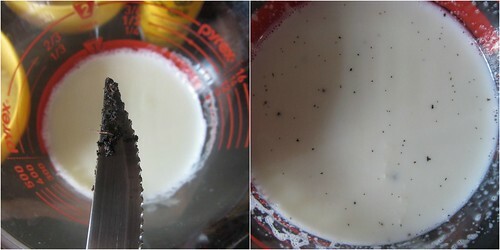 Scrape the seeds of 1/2 a vanilla bean and stir into the warm milk. 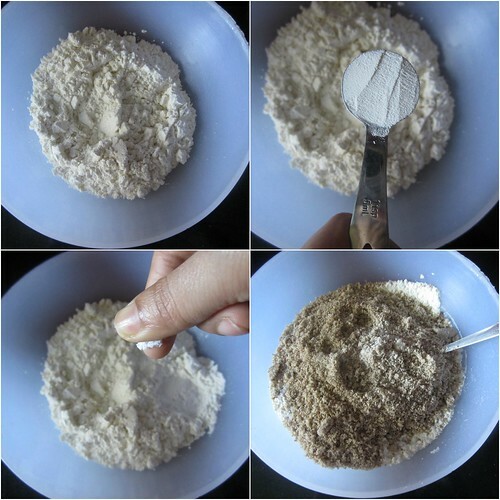 Sift together flour,baking powder and salt.Mix in the almond meal. 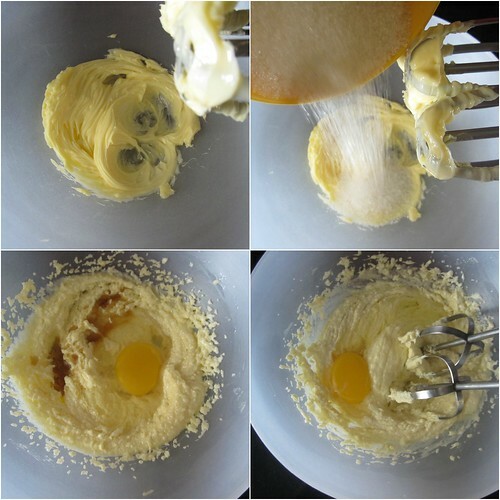 Beat together butter and sugar till creamy.Mix in the eggs one by one followed by vanilla. 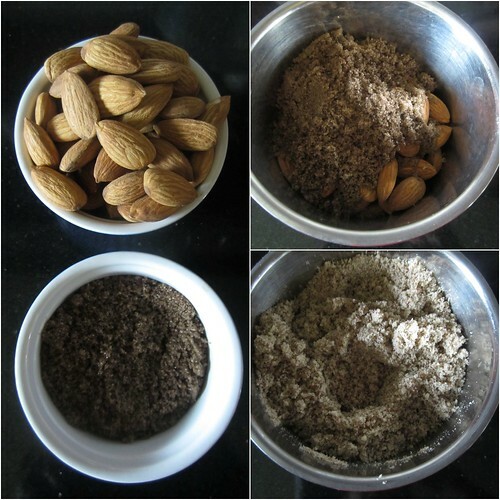 Alternately add flour-almond meal mix and milk beginning and ending with flour,flour in 3 lots and milk in 2.Fold in the chocolate chips,dusted with a tsp of flour for even mixing. Divide the batter between the liners and bake for about 20-22 minutes or until a toothpick inserted into the center comes out clean. 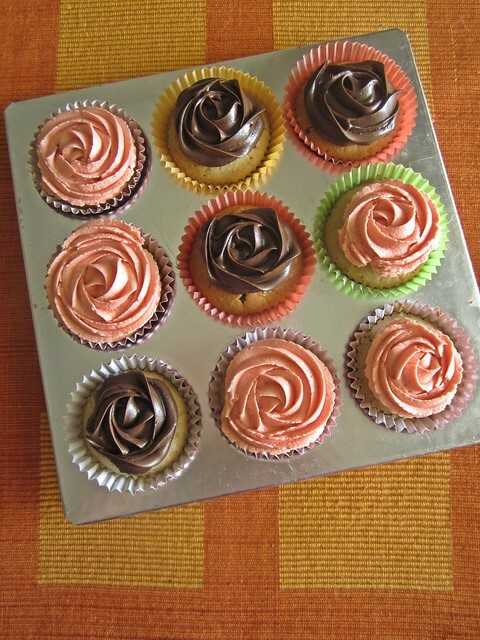 For icing,I used buttercream and ganache.Used Wilton 1M and 2D nozzles.